Here's an interesting post I found on the"King James Only" CARM discussion board, relating to the idea that particular translations of the Bible receive divine approval. Apparently, some of the KJV only folks argue that Luther's German Bible was God's approved German translation. I'm sure Luther would have been flattered by that! The point being addressed is if Luther's German translation was divinely approved of and the KJV was divinely approved of, why are there differences? If according to KJV-only reasoning Luther’s German Bible and the KJV are equal to the same underlying texts, it suggests that they are equal to each other. When the water of the Received text was poured out into Luther’s German Bible, did it not remain the same water according to KJV-only reasoning? If according to KJV-only reasoning Luther’s German Bible and the KJV are equal to the same thing [the self-attesting, self-authenticating word of God], it again indicates that they are equal to each other. J. J. Ray maintained that “things equal to the same thing are equal to each other” (God Wrote Only One Bible, p. 29). Likewise, D. A. Waite acknowledged that “things equal to the same thing are equal to each other” (Fundamentalist Deception, p. 84). Waite wrote: “As in geometry, two things that are equal to the same thing are equal to each other” (Critical Answer to Michael, p. 119). According to the KJV-only view’s own tree, Luther’s German Bible and the KJV are branches on the same tree. This would also seem to imply that they are equal to each other. 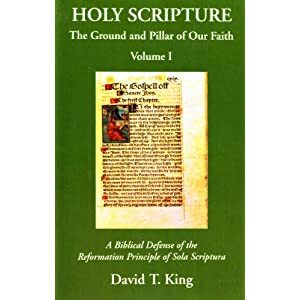 In his book Biblical Scholarship, Ruckman referred to the “Luther‘s Bible and the King James Bible” (p. 56), “Receptus of King James and Martin Luther” (p. 94), “Martin Luther’s German Bible and the King James Bible” (p. 142), and “Martin Luther’s German Bible and the King James Authorized English Bible” (p. 390), seeming to make them equal. According to a consistent application of KJV-only claims and reasoning, Luther’s German Bible and the KJV would have equal authority, and one of these translations cannot have greater authority than the other. If a standard and consensus English translation of the Received text is supposed to be self-attesting and self-authenticating, a standard and consensus German translation of that same text would also need to be self-attesting and self-authenticating. Is Luther's German Bible the consensus and sole final authority for believers that speak German? Can there be two varying and different consensus sole and final authorities for any believers that speak both English and German? Based on what greater authority or standard can it be claimed that one of these translations is greater than or superior to the other? If there are any differences between them, it is valid evidence of the need a greater authority than either of these translations to determine which is more accurate. All the editions of Luther's Bible published during Luther's lifetime did not include 1 John 5:7, Mark 11:26, and Luke 17:36 in addition to many other differences when compared to the KJV. When compared to the KJV, Luther's Bible was also missing phrases at John 19:38, James 4:6, 1 John 2:23, Revelation 18:23, and Revelation 21:26. Glenn Conjurske observed: "The fact is, (in addition to numerous other differences) there are whole verses in the King James Version which neither are nor ever have been in Luther's German" (Olde Paths, Sept., 1997, p. 212). Preserved Smith reported that 1 John 5:7 was first placed in the German Bible in 1575 (Age of Reformation, p. 570). Conjurske also pointed out that Luther omitted 1 John 5:7 from the revised edition of the Latin Vulgate that he published in 1529 (March, 1997, p. 72). KJV-only author Peter Ruckman seemed to suggest that “Luther’s German Bible is nearly identical” to the KJV (Bible Babel, p. 91). Ruckman recommended “Martin Luther's German version" (Scholarship Only Controversy, p. 1). In his commentary on the book of Revelation, Ruckman wrote: “Martin Luther’s German Bible is the same text as the King James, 1611” (p. 80). In his same commentary, Ruckman asserted: “Martin Luther’s translation of the Bible is a monument in the German language, exactly as the King James Bible is a monument in the English language” (p. 82). Ruckman wrote: “Martin’s German Bible is the German King James Bible. It is the equivalent of the ‘King’s English,’ and so all affirm” (Biblical Scholarship, p. 146). Ruckman wrote: “God produced a German Textus Receptus for the Continent” (p. 230). Ruckman asserted: “Never hesitate to correct any Greek text with the text of the ‘Reichstext’” (Monarch of the Books, p. 19). Bradley stated that Luther's Bible "is still considered the preserved Word of God for the German-speaking world” and that it “was produced from the same reliable text as the King James Bible" (Purified Seven Times, p. 36). "One of the most asinine things you ever heard in your life is a modern, present-day evangelist, standing in the pulpit, talking about great revivals to come, when he no longer believes the Authorized Version is the word of God. Martin Luther's German Bible is the same text as the King James, 1611. Subsequently, all Bibles in Europe and the United States, from these translations, are Textus Receptus, Greek Byzantine text, Syrian type text, and they are NOT the text of the North African Latin Church - in other words today, the Roman Catholic Church." If the KJV only position has been put forth accurately, then the refutation is sound. Dr. White points out that the KJV only advocates claim the Textus Receptus is the "text of the Reformation." It would not surprise me at all to discover KJV only advocates molding history to fit their paradigm. The reference to Preserved Smith can be found here. Smith was a knowledgeable Reformation scholar and not one to defend the Reformers at all costs. One will find that in this text one page earlier Smith describes Luther's Bible: "Among the great vernacular Protestant versions of the Bible that of Luther stands first in every sense of the word." A paragraph later he states, "All too much Luther read his own ideas into the Bible." Of the reference in question, Smith states, "Also, following the Erasmian text, he omitted the 'comma johanneum' (1 John v, 7); this was first insinuated into the German Bible in 1575." We have informed our readers in these pages before that Luther omitted I John 5:7 from every edition of his German New Testament which he published during his lifetime. I have recently learned that he also omitted it from the revised edition of the Latin Vulgate which he published in 1529. 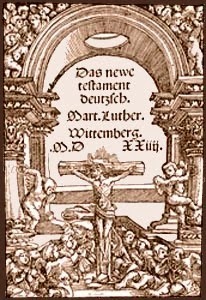 This edition is printed in the large German edition of D. Martin Luthers Werke (Weimar: Hermann Böhlaus Nachfolger, 1914)----no indication in the book which volume this is of the whole set, but it is Fünfter Band of D. Martin Luthers Deutsche Bibel. The text of I John 5:7-8 appears thus: Quoniam tres sunt qui testimonium dant, Spiritus, Aqua et Sanguis, et hi tres simul sunt. The common Vulgate text (Clementine edition), on the other hand, reads thus (with the words omitted by Luther in bold type): Quoniam tres sunt qui testimonium dant in cælo: Pater, Verbum, et Spiritus Sanctus; et hi tres unum sunt. Et tres sunt qui testimonium dant in terra: spiritus, et aqua, et sanguis; et hi tres unum sunt. This omission was a bold step on Luther's part, for, as Scrivener informs us, the verse is found “in perhaps 49 out of every 50”[manuscripts of the Vulgate, but the very boldness of the step proves beyond cavil, if any further proof were wanted, that Luther did not believe in the genuineness of the verse. The information about Luther's Bible not including 1 John 5:7, Mark 11:26, and Luke 17:36 appears on various websites, (typically discussion boards) debunking KJV only arguments like this one: "the fact that Luther's German Bible did not include Mark 11:26, Luke 17:36, 1 John 5:7, and many other clauses and phrases in the KJV is ignored." Luther's treatment of 1 John 5:7 is a well-known fact. This old Sunday School newspaper mentions that it was the printer Feyerabeud who inserted 1 John 5:7 into Luther's Bible in 1574, and this old source says it was in Frankfort 1574, but later in Frankfort in 1583, it was taken out again. The information about the other verses isn't as easy to locate. This website claims to have a 1545 Luther Bible. Luke 17:36 is missing, while Mark 11:26 is included, but is actually what we know to be the later part of Mark 11:25: "auf daß auch euer Vater im Himmel euch vergebe eure Feile." Other online 1545 Luther Bible's have the missing verse 26. It is also asserted that "Luther's Bible was also missing phrases at John 19:38, James 4:6, 1 John 2:23, Revelation 18:23, and Revelation 21:26." If you Google search this, it appears to me it's probably the same person that's responsible for all the hits. I would be interested to know who originally did the research. I took the time to compare the online 1545 Luther Bible to the 1912 online Luther Bible. 1545: Darnach bat den Pilatus Joseph von Arimathia, der ein Jünger Jesu war, doch heimlich aus Furcht vor den Juden, daß er möchte abnehmen den Leichnam Jesu. Und Pilatus erlaubte es. 1912: Darnach bat den Pilatus Joseph von Arimathia, der ein Jünger Jesu war, doch heimlich aus Furcht vor den Juden, daß er möchte abnehmen den Leichnam Jesu. Und Pilatus erlaubte es. Da kam er und nahm den Leichnam Jesu herab. 1545: und gibt reichlich gnade. 1912: Er gibt aber desto reichlicher Gnade. Darum sagt sie: "Gott widersteht den Hoffärtigen, aber den Demütigen gibt er Gnade." 1545: Wer den Son leugnet Der hat auch den Vater nicht. 1912: und das Licht der Leuchte soll nicht mehr in dir leuchten, und die Stimme des Bräutigams und der Braut soll nicht mehr in dir gehört werden! Denn deine Kaufleute waren Fürsten auf Erden; denn durch deine Zauberei sind verführt worden alle Heiden. 1912: Und man wird die Herrlichkeit und die Ehre der Heiden in sie bringen. What a strange matter. No, I don't think Luther would have been flattered. He did not talk in such ways. He talks about the doctrine and the gospel being "his", though mentioning that really it is God's. When Luther says "by faith ALONE" in his translation, and people suggest that the "alone" should not be there, it is just such a thing. The teaching and gift is God's. It proclaims the gospel to all the world. It is a true biblical, evangelical, Christ-centered teaching. It is Luther's teaching and Luther's translation, but the meaning and word of proclamation are really God's. And that is the beauty of it. Thanks be to God. And thanks also be for Luther's teaching. Amen. Guy Fawkes, do you see how you have absolutely nothing to say about Jesus Christ?